Traditionally one would not expect your bedroom to open up to your living room. We at Bloomming strive to create innovative design products to improve both spaces in style. Meet our versatile room divider Facet! Say you want to renovate a beautiful old factory space or loft and turn it into your home. Chances are you will have big open spaces that you want to change into a practical and cozy place to live. Or perhaps you want to combine your office work area with your private quarters. When you are trying to utilize spaces in your house creatively, it can happen that your bedroom is in the same space as your living room. Also when you have a studio apartment your living and sleeping area will flow over in one another. To separate these two very different functional spaces, you will need a screen of some sort. Facet, our bedroom and living room divider is absolutely perfect for this purpose. 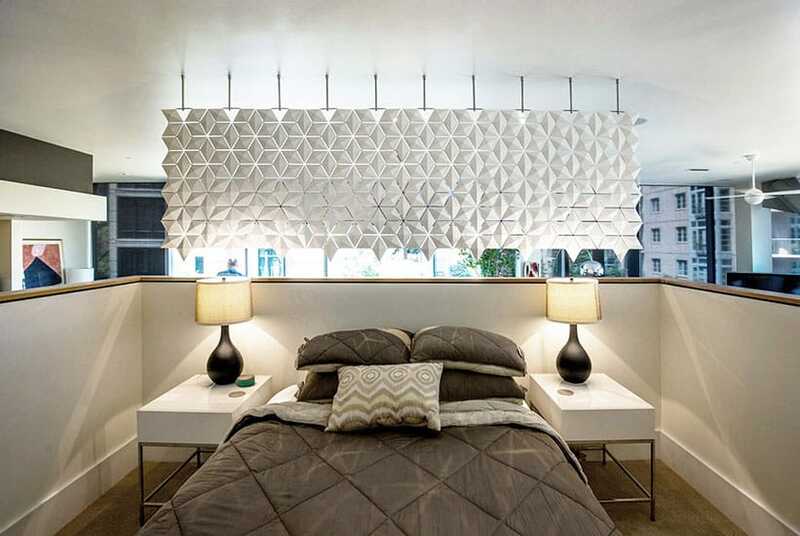 Our bedroom and living room divider, Facet, has a striking geometric pattern. This gives it a unique, sophisticated look. Its stylish design means that it will look great in any setting you want to use it – it looks just as fantastic in a bedroom as it does in a living room. So in the case where you want to separate these two spaces from each other, Facet is the ideal option. Some room dividers look pretty from the front, but from the back they don’t. That is not the case with Facet. Both sides of Facet are breathtakingly beautiful. Designer bedroom and living room divider which is highly customizable. Big or small, Facet adds the finishing touch to your décor. Whether you need a bedroom and living room divider in a big space like on the pictures featured here, or you need it in a small studio apartment, Facet will leave you in awe. It is a fully modular system which allows us to make it in any size you want. Visit our order page and simply select the width and height you prefer. If you want it in specific dimensions that we do not offer on this page, give us a call or send us a mail and we will see what we can do. Facet is designed in a way that it is customizable. The bedroom and living room divider seen in the photos is installed in an upmarket loft in Portland, USA. It separates the living area from the sleeping area and gives the sleeping area a little more privacy. It looks absolutely beautiful from the inside of the bedroom area as well as from the living room area.